Junior Suites are located in the second building located a few steps across the street from the main building. 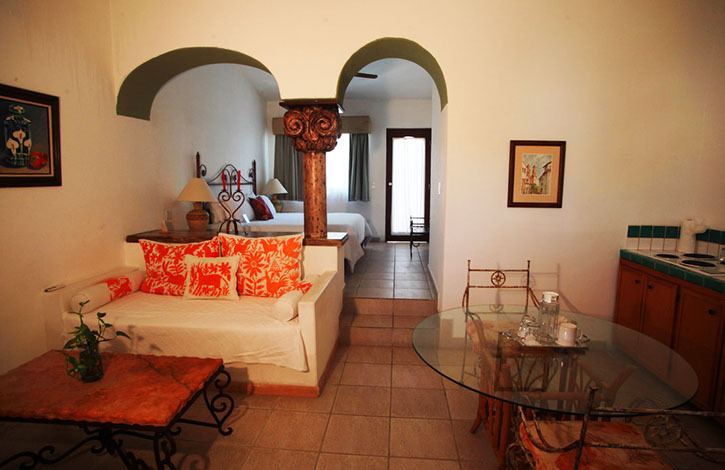 Incredible vegetation and a fire place will make you want to spend time sitting in the courtyard with mexican style statues and ambiance, allowing you to have an intimate experience with your loved ones. All Junior Suites have outdoor terrace seating areas. Junior suites include the following: spacious room with king size bed, living room area, sofa bed, walk in closet, hair dryers and makeup mirrors, kitchenette, private bathrooms, coffee maker, dining space, television/cable, wifi, air conditioning, and mini bar. Reservations, cancellations & refunds policies. For your convenience, front desk reception hours are from 7:30AM to 11:00PM. If you will be checking in after 11:00PM please notify us in advance. We charge one night at the time of booking. 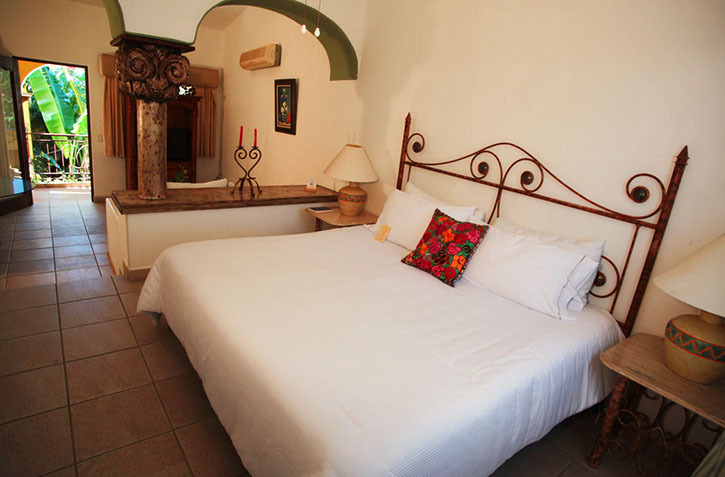 All rooms must be fully prepaid 7 days prior to arrival. For groups bookings Christmas and New Year (December 20th – January 4th 2016), full payment is required 30 days prior to arrival. No charge for children under 10 years old, when sharing room with parents. Rates are subject to change and are guaranteed on prepayment basis only. Cancellations & refunds. All cancellations are subject to US$35.00 handling fee. Cancellations must be send by email at least 7 days prior to arrival in order to receive refund of deposit (less handling fee). All reservations cancelled outside the cancellation period will have a one night penalty charge. FOR GROUPS (NO MATTER ARRIVAL DATE) AND FOR RESERVATIONS FOR CHRISTMAS, NEW YEAR SEASON (DECEMBER 20th – JANUARY 4th 2016) MUST BE CANCELLED AT LEAST 30 DAYS PIOR ARRIVAL IN ORDER TO RECEIVE REFUND, OTHERWISE APPLY ONE NIGHT PENALTY CHARGE.